Title: THE ANCIENT AND PRESENT STATE OF GLOCESTERSHIRE [Gloucestershire] .. Second Edition. Illustrated with seventy-three copper-plates, Containing a Map of the County, a Plan and Prospect of the City, a View of the Cathedral, Sixty One Seats, and Three Hundred and Twenty Coats of Arms, of the Nobility and Gentry residing in the County at the Time of the first Publication. Description: London, T. Spilsbury for W. Herbert 2nd edition. 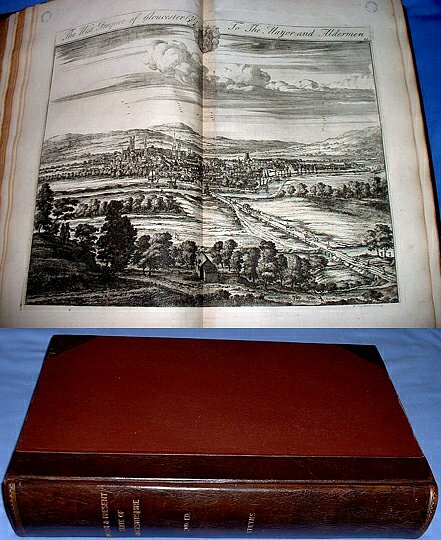 1768 Double-page copper-plate bird's eye views (61 complete) of estates in Gloucestershire by J. Kip + double-page map of the county, plan & view of Gloucester City, and cathedral view + 8 single page plate. Folio half brown calf and cloth sides with spine gilt titled (tips leather worn, spine rubbed & bottom edge shelf wear). Titlepage with decorative woodcut + pp Preface & Advertisement +pp coats of arms printed one side only + pp author's epitaph and plate list + double-page Map of Glostershire +452pp + pp Index. Ex-library with bookplate of Cheltenham Library Reference Department to pastedown + partially legible stamp of "Glos. Withd** for sale" to free endpaper. Light stain to top margin of title and 3/4-inch circular library stamp at foot, neat manuscript shelf mark & date on blank verso. The same small round purple stamp neatly placed on top corner margin & blank verso of each plate, first preface page & last index page also stamped in margin. Printer's smudge of print-ink to the title-panel of Hales Abbey plate, and an old marginal repair without loss to the plate of Knole. One of 2 Henbury plates which should be at p248 has been placed at p218. All plates on good thick quality paper with broad margins, beautifully printed and stubbed out from gutter so the plates lie flat when opened. Stubbing paper rather browned and in some cases with narrow brown offset to text in gutter area, but front of plates only rarely affected. All plates present and text complete, no foxing, paper crisp and pages well attached, in sound if unexciting early 20th century half-leather binding. *Complete copy of one of the best illustrated county histories of England with good wide margins.